A neologism combining floriography and Theosophy, FLORIOSOPHY interprets coincidences of meaning in these two systems, tracing a cultural movement towards abstraction and esotericism. From the English Victorians, Americans received an enthusiasm for gardening and a code of decorum, which coalesced in floriography, or the Language of the Flowers. A profusion of books written during the early- to mid-1800s explained secret meanings of flowers, allowing lovers to send encrypted messages as symbolic bouquets. Founded in New York City in 1875, Theosophy influenced other mystical philosophies and contributed to the development of abstraction in art. The important Theosophist work Thought-Forms (1901), like the books on floriography, is a sort of dictionary decoding a hidden form of communication. In both, human emotions are expressed symbolically; through flowers and their arrangement, or through energy manifesting as abstract form and color. A performance and visual work, FLORIOSOPHY exists in the areas of overlap, where flower, form and color find energetic confluence. THOUGHT-FORM DOILY NO. 11: RADIATING AFFECTION melds traditional floral motifs and floriographic meanings with abstract form and colors from the thought-form palette (presented in the 1901 book Thought-Forms) into a crochet hybrid that breaks from the conventional circle into a free-form thought-form. The specific color of the thread, hand dyed using plants and flowers, represents affection in floriography and Theosophy. FLORIOSOPHY is a program of original songs and interpretations of Victorian ballads and a Theosophist composition performed on horse-hair fiddle and voice. Each song transmits the emotional energy of specific flowers or plants according to floriographic interpretations. The oversized doily "stage" evokes Victorian tussie-mussie bouquets which were often bound at the stems with a doily. ROSE WHISTLE, made from a rose branch and played on the original FLORIOSOPHY song O Rose, Thy Heal The Sick. SPIRIT HOUSE riffs on cross-cultural methods of house protection—objects, words and rituals used to attract beneficent or repel malevolent spirits or influences. Having grown up in southeastern Pennsylvania surrounded by Amish farms, I took the Pennsylvania Dutch hex sign as a starting point. The popular belief that hex signs are intended to keep away evil forces is in dispute, but members of the Pennsylvania Dutch community do practice a form of spiritual magic called Powwow or Braucherei. Melding Christian and pagan beliefs, this system bears similarities to Hoodoo, which was popularized in the American South. Both absorbed elements of Native American tradition, Jewish mysticism and iconic grimoires. The doily is a common decorative item that serves to physically protect domestic articles. Its circular form, often containing a star motif, echoes the hex sign as well as the magical circle. 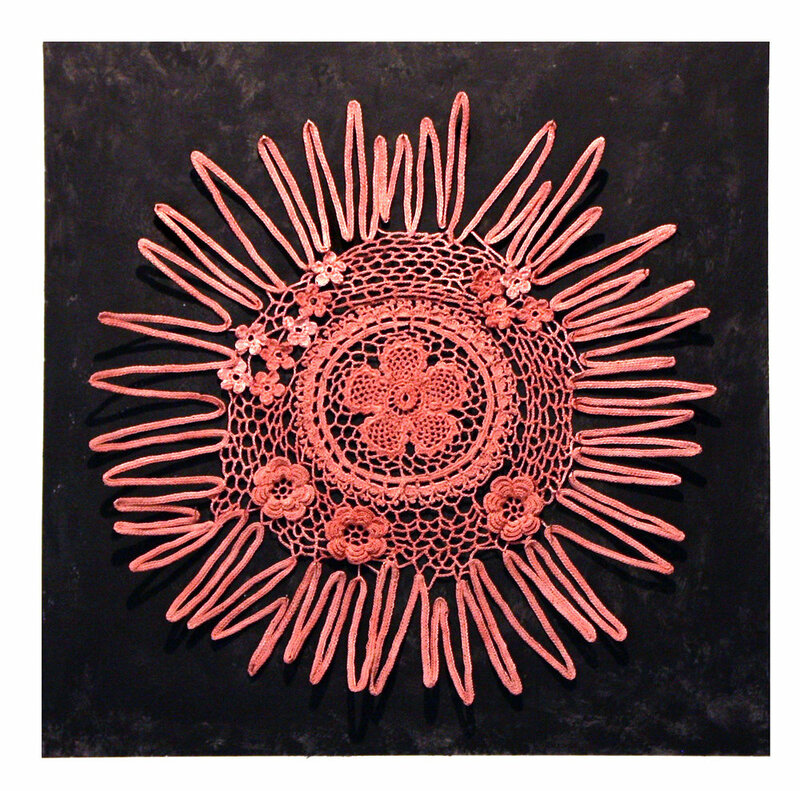 Embellished with the charged materials of Hoodoo and Germanic folk belief—horseshoes, scissors and the railroad spikes that nail this crocheted work into the corners—the oversized doilies become fetishes to ward away or trap negative influences. TEX HEXES painted on hub cabs include classic symbols of Texas -- the longhorn, yellow rose and mockingbird. LET A THREAD LEAD YOU HOME The intricate pattern and traditional material of a doily—thread—also suggest a labyrinth, most famously the Minotaur’s labyrinth of Greek mythology, from which Theseus escaped using a thread provided by Ariadne. 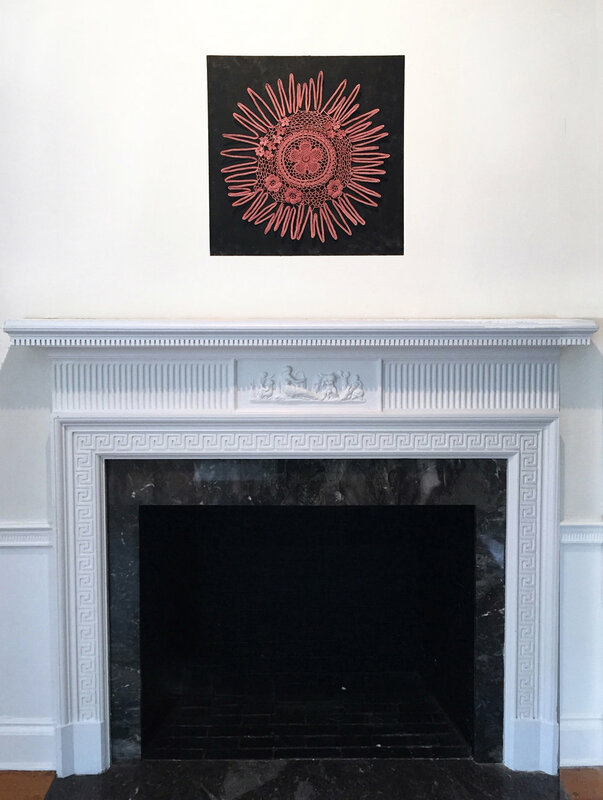 ELECTRICAL WIRE DOILY references the association between electricity and the spirit world that arose during the Spiritualist movement in America at the beginning of the 20th century. 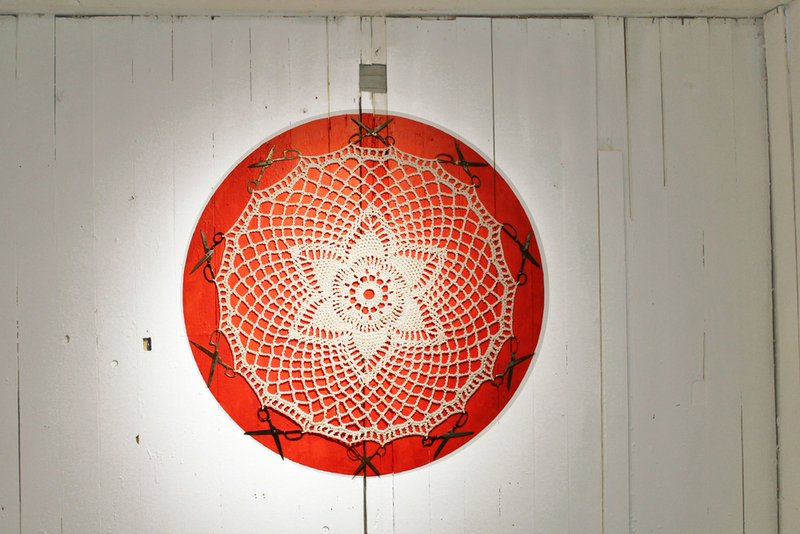 Crocheted from over 1500 feet of electrical wire, the doily powers the light in the room. SPIRIT LABYRINTH, a ghostly text printed in photoluminescent ink, echoes Pennsylvania Dutch illuminated documents called Frakturs, some of which were presented as Spiritual Labyrinths. It also calls to mind the cryptic lines of spells, such as the graphic SATOR square used in both Hoodoo and Powwow practice. The nightshade or Solanaceae family of plants includes the edible potato, eggplant and tomato as well as poisonous belladonna, mandrake and thornapple. Some of these dangerous nightshades and potentially lethal species of other plant families are regularly planted for their showy flowers. Their beauty belies extreme toxicity. Paradoxically many of these poisons have medicinal use when taken in low or homeopathic doses. However the margin of safety is easily crossed. The extreme effects of these plants have been a source of awe and fascination since ancient times, giving rise to myths, folklore and ritualized usages. NIGHTSHADE draws upon this rich descriptive and imaginative history. Imagery on printed window shades and poetic texts on the window arches take inspiration from recorded usages, symptoms and beliefs described in early botanicals, Greek mythology, historical records and other sources. Decorative painted or printed window shades were popular throughout the 19th century. Responding to the history of Wave Hill's Glyndor House--the first Victorian house on this site was built in the 1860s--NIGHTSHADE takes the form of four window shades printed with ornamental floras of poisonous plants. Monkshood and Foxglove shades. Monkshood was imagined to have grown forth from the spittle of the three-headed dog Cerberus and foxglove was said to be favored by malicious fairies. Lights in the room brighten and dim on a cycle, alternately exposing and obscuring printed shades and mysterious glowing words. Suggesting relationships between life and death, the fluctuating lighting expresses the inherent dualities of these plants, contrasting medicinal benefits with toxic capabities and the deceptively lovely flowers with sinister stories.